Nuendo / SX Benchmarks :. Blofelds DSP 40 - Page 1:. The Test Session was created using elements of the original Blofelds Return Demo. I have modified the original Demo by first Bouncing all of the Guitar and Synth Tracks into respective stereo tracks. I have kept the Drum Tracks as they are. I did this to give a constant audio loading as the original track had short audio comps all over the place which would not give a constant loading. I have also created and added audio tracks containing full Sine Waves following the instructions given by Joe at UA on the forum, worked a treat. An Original Nuendo / SX Version 3.0 DVD is required to obtain the source files. Copy the complete Blofelds Return session folder off the Nuendo or SX 3.0 DVD to your Audio Hard Drive. 2 x Bounced Waves + 25 Sine Waves to the Audio directory of the Blofelds Return Session Folder. The Test Session will take about 15 Minutes per latency setting to complete. Load the session. You will notice there are Magneto's listed as inserts on each channel strip, selecting each channel as you scroll across the mixer panel , will update the channel strip to the appropriate channel. Then while the session is playing, progressively turn on each Magneto until you hear any audio breakup. The number of Magnetos that you can successfully load is the figure we are after, not the actual CPU loading. Save the Session at the Maximum Load. Some tips on interesting behavior that has been experienced running the test session, that you should be aware of just in case you encounter the same anomalies. The severity of some of the behaviour varies greatly depending on the Audio Hardware that is being used. It should be noted that this session is designed to place extreme loadings in the system, and you should not be too alarmed at the issues being experienced. 1. Sometimes the session may overload or glitch on first playback. Hitting the 1 Key to reset to the left indicator clears the audio buffer and the session should then playback fine. You can then start loading the Magneto's. 2. When running the session, as you turn on each Magneto , you do get a slight glitch as Nuendo buffers the PDC into memory, you will see the HD jump, and it will slightly pause, that’s fine. 3. You may encounter a pronounced pause/freeze , the exact point varies on different systems, allow it to settle, and continue. 4. Loading the Magneto's may also drop the audio driver out. Stop Playback , Hit 1 to reset to the left indicator, and continue. 5. It has also been noted that results may vary on consecutive runs with certain audio cards. At each latency setting, it is required to run the session at least 3-4 times , each time exiting out of Nuendo and then re-starting the App, loading the session again, and running thru the test. Report any variance . 6. The same can also be applied with a re-start in between runs @ each latency setting. 7. When shifting the test to a different latency setting, always restart the system. 8. If you manage to exceed the 40 Magnetos that are preloaded, scroll back to the first track and just start doubling up on each track as needed. 9. When approaching the maximum loading, solo one of the Sine Waves and raise the volume of that track to monitor for clicks more easily. The Above results were collated from data collected both in house and from end users at the Nuendo Forum . The X2 and Pentium D DualCore systems were run at both Standard and Overclocked settings. The X2's also show significant improvement over the earlier Dual Opteron systems over and above the slight clock differance between the 2 systems. 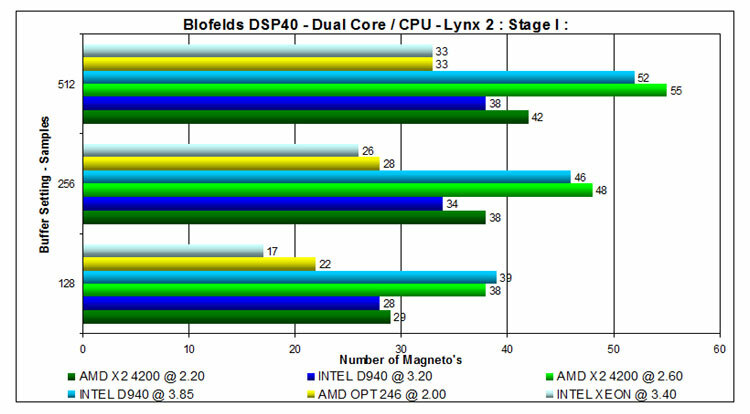 More detailed System Specifications can be found listed on the forum, it should be noted that the X2 figures were achieved on an earlier nForce3 Ultra chipset - the results will be updated with current PCIe chipsets when results become available. 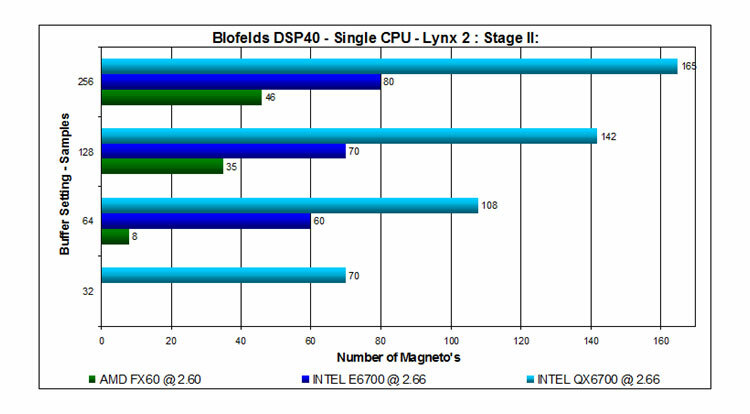 Results have been updated with Intels new Core2Quad added. I have maintained a direct comparison - clock for clock between the New Intel Core2 Duo/Quad CPU's, and the Current AMD Platform, they were collated from internal testing and results posted at the Nuendo Forum. For consistancy I have maintained and will continue posting the reference results with the Lynx 2 Card. Where the New Intel Core2Duo architecture litterly " hit the ball out of the park ", the new Quadcore chips have raised the Performance Bar to levels never experienced or even thought possible in a Single CPU environment. Comparisons with various Audio Hardware will also be continually updated as data is collated. 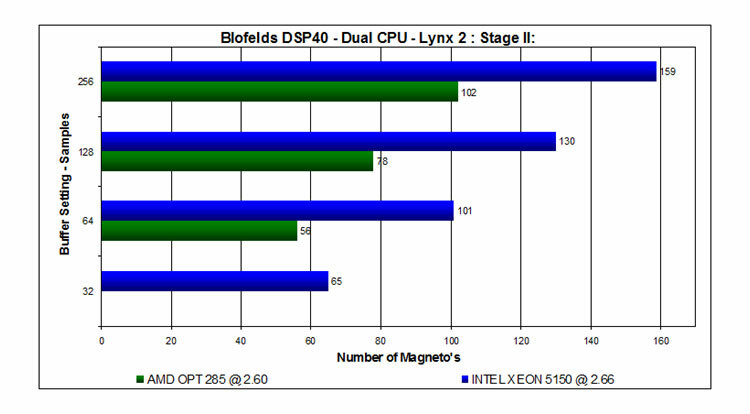 With the final release of Intels DualCore Xeons, we can now move to the developing Dual DualCore Landscape. These results were collated from both in-house testing and figures posted at the Nuendo Forum. As with the Conroe/AM2 Landscape, results will be regularly updated as the testing progresses with Speed Grades for both the respective platforms. I have updated the results with a 5150 Xeon system to give a clock for clock comparison, its obvious that the new Intel Xeon DualCore systems have flowed on by the example set by the Conroes chips in raising the performance bar quite substantially on this test. In regards to the limited Data that was available previously for even the AMD Dual DC systems, I have written a report on " The Mystery Of The Missing Quads ", to try and give some insight on what I feel was the reason why there was a lack of participation from a select sector in the first Stage of Testing. An updated Queries, Qualms , FAQ section, with Ongoing Analysis has been added here. After over 2 1/2 years its time to close the chapter on the original Blofelds DSP test session , and move on to the next level. The above graph shows the performance comparison of a Single Quad system against an identically clocked Dual Quad system before and after a microcode update that had for the greater part resolved the x-scaling issue being experineced on the Dual Quad systems for over 15 months. The original Bolfeds DSP test session has served us well over the years, and the collated results have given us a clear indication of just how far Native DAW scalability has come. From the original round of tests where loading 50+ plugins on top of the template was considered impressive, to the stage now where we can load upwards of 300 at the same latency setting on identical audio hardware is quite astonishing. All Future testing will be focused predominantly on the new DAWbench DSP -Universal Benchmark, which can be easily configured for any Audio Application. Results for the first round of testing can be found in the DAW X-Scaling Shootout report that can be accessed via the link below or from the front page. MP Scalability: Repise Light At The End Of The Tunnel ? :. 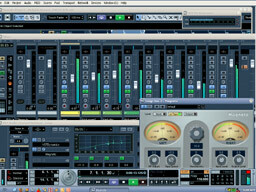 DAW X-Scaling Shootout : Cuebndo v Reaper v SONAR :. PC DAW O.S Shootout : XP 32 v XP64 v Vista :. MP Scalability: Have We Hit The Wall ? :.